For our first breakfast on Enmore Road we’ve arranged quite a party, or rather it arranged us. Strop and Jill had been looking for an opportunity to catch up while Jill’s sister Monica was in town, but the only opportunity available was Saturday morning for breakfast at Scrambled. We all live such busy lives these days that we hardly get to see each other. Anyway, it turned out that John and Pauline were also in town and keen to catch up too, so they invited themselves. Strop and I were just setting out, a bit late and wondering which was the quickest way to walk to Enmore Road, when Roy, Jill and Monica pulled up in front of us, offering a lift in return for advice on parking. So we got there 15 minutes early, rather than 15 minutes late, and Strop had plenty of time to negotiate seating arrangements for our party of seven. After a bit of encouragement from Strop, the waiter gave up the information that there was a secret room out the back that we could use. The back room looked as if it didn’t get used much except to get to the car park, but there was a big table and plenty of room for us to spread out. 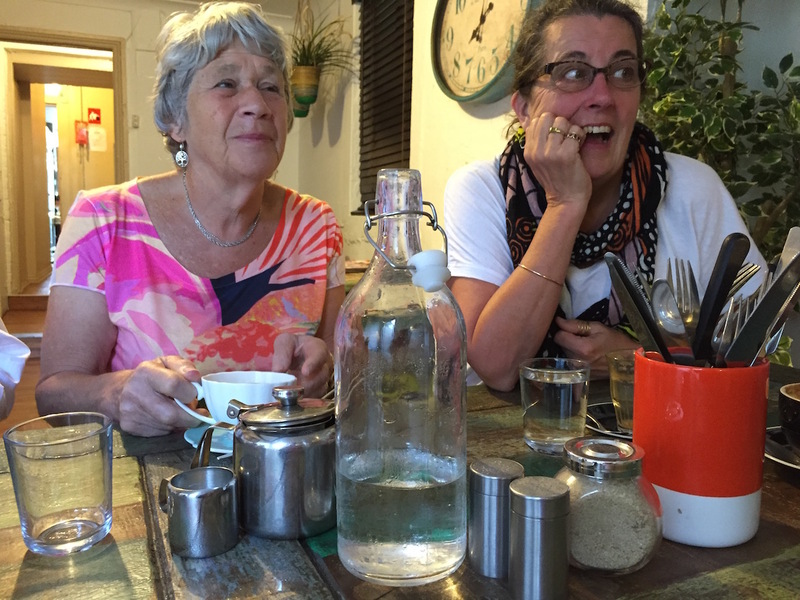 The main advantage was that it was quiet, and with all of us getting a bit harder of hearing these days, that is a rare relief at a Newtown cafe. The front of Scrambled is quite noisy because of the traffic, exacerbated by the nearby bus stop. 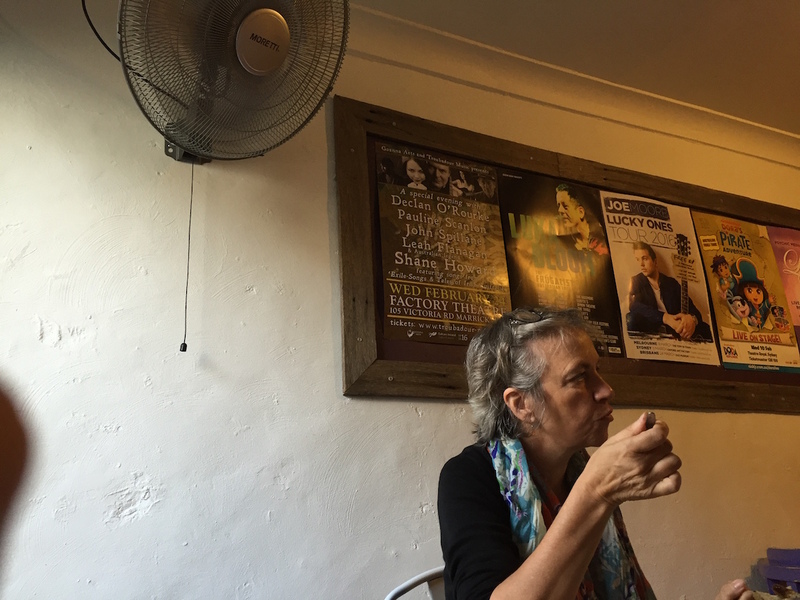 It was a very humid morning, so the waiter turned on the wall-mounted fan, which immediately started blowing the pages of the menus around. Without consulting the management, we decided that it wasn’t really that hot, and we would rather not have the distraction of pages flapping back and forth, so we turned it off. While we were enjoying a bit of calm air, we ordered a round of coffees, and got on with the important business of catching up. The waitress that brought our coffees immediately noted the lack of a gale in the back room, and turned the fan back on. We were all too busy chasing flying napkins and menu pages to ask her why. Presumably it was company policy. Not long after, when we had managed to weigh everything down, John called wondering where we were. There were a few minutes of confusion before we realised that he and Pauline were sitting out the front, guarding “a very nice table” in the hope that we would turn up shortly. I don’t think we ever worked out exactly how long they had been sitting there, but in the end our private room, trumped their “very nice table”. Now that we were all co-located we got serious about what was on offer on the menu. John and Pauline were the only ones who had been to Scrambled before. They used to live nearby and be regular visitors. It also turned out that since moving to Braidwood, John and Pauline had become neighbours of the previous owners of Scrambled. This bit of knowledge was enthusiastically received by the waiter who proceeded to query John about details which, judging by his expression, quickly outdistanced John’s knowledge on the subject. But even so, small world and all that. Scrambled’s breakfast menu is very spacious, each category given it’s own page on the clipboard. It was Strop’s turn to have the big breakfast, so I was free to try out the scrambled eggs, which seemed appropriate given the name of the establishment. Strop went for the Aussie Big Breakfast with scrambled eggs, of course, while I went for the Spanish Scrambled eggs. John and Pauline both chose the Green Scrambled eggs, but with different sides. Roy had a breakfast quesadilla, Jill the English Country Scrambled, and Monica went for eggs Benedict. After the waiter had taken our orders, Pauline decided she was sick of having her hair blown back and forth, and wanted to see if the fan could be stopped from oscillating. It turned out that it could, but only by blasting the gale at either John or me. We decided it was more democratic to share the breeze, and for Pauline to perch her glasses on top of her hair to stop it blowing about. In the meantime our juices had arrived. The orange was very good, Strop had something green that she said was delicious, and Jill had a purple berry smoothie, which oddly came in a purple tinted glass. Apparently, it tasted alright though. 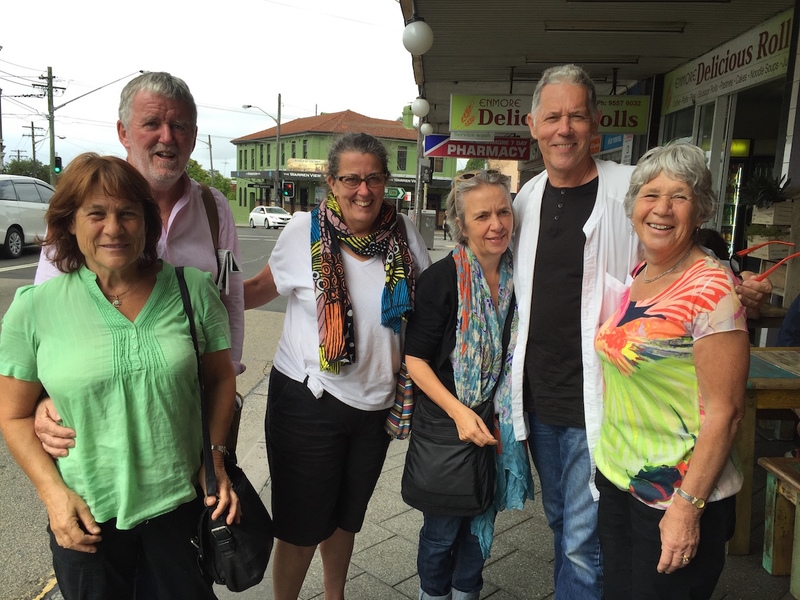 In order to reduce the tension, someone asked about John and Pauline’s integration into Braidwood society. They proceeded to regale us with their adventures, including the great quilting committee conundrum, and the recent coup d’état at the museum. It seems when you move to a small country town, sooner or later you have to choose sides. I guess the trick is to be on the winning side. I had pretty much finished my breakfast before I remembered that I was supposed to be writing a review. When I asked what everyone had thought of their food the responses were all enthusiastic. My Spanish scrambled eggs were excellent, packed with cheese and chorizo and peppers. The only negative aspect was that they had cooled down a bit before they got to the table, probably due to a small kitchen trying to get all our breakfasts out at the same time. Monica’s eggs Benedict seemed to be another victim, their arrival delayed by an unfortunate accident, when her first set of poached eggs were transferred to the kitchen floor rather than to the plate. While I was remembering my responsibilities, I remembered that we have had a request to comment on accessibility issues. On this front, I can report that the main cafe space has a short ramp up from the street, but if you want to get to the back room there are steps everywhere – up down and sideways. And don’t even ask about the toilets. Strop rated it one Susan out of a possible five, on the accessibility front. Another friend wants us to lift our game on the subject of value for money. So given the quality of the food, I would give Scrambled four out of five Wendys. The staff were excellent, and were very accommodating about splitting the bill. On the way out the waiter asked me if everything had been okay, which it had, and also to give his regards to the old owners in Braidwood. Us grey haired blokes, we all look the same. 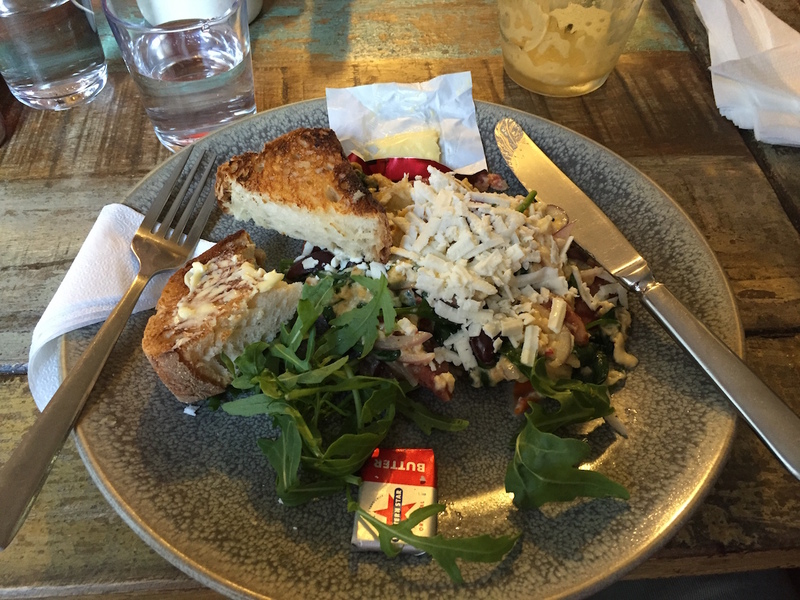 Jill had bacon and it was wonderful….